I'm not sure what you mean when you call Home Depot "the older company", But Lowes, as a company, is much older. Lowes was founded in 1946, went public in 1961, and began trading on the NYSE in 1979, the same year HD opened their first stores. You're right, Anon, the use of "older" is not clear. But since HD has many more stores, while Lowe's is playing catch-up, many of HD's stores have been around longer, which is the context I refer to. Do you have any opinion on whether each will expand? I live in Rockport 30 miles north of Corpus Christi. Lowes is 6 miles away in Aranasas Pass. HD has two in Corpus. Does that give them enough market penetration or would you think they may add a store in our town of 11,000? IS there anywhere where these companies list sales per store? Is there anywhere where one can find sales per store? I'm wondering if either company is planning to expand to my town of Rockport TX, there's a Lowes 7 miles away in Aransas Pass and two HD's and a Lowes in Corpus Christi 32 miles ( but no traffic issues-just 32 min away). I don't think our town of 10,000 would be a good market that hasn't already beeen penetrated by both but one never knows how they think? Considering the state of the housing market, I wouldn't expect any meaningful expansion from these companies. They don't list the sales of individual stores, but to get an average you can divide total sales by number of stores. Bar graph is a bit misleading. At first glance it makes lowes looks like a drop in the bucket. My take is that HD is in major need of a makeover! Tired looking stores, associates wearing those awful dirty, tattered and paint splattered aprons needs to go. In this regard HD is losing ground to crisp looking, much better Lowes. HD are shelf pilers, Lowes are merchandisers, better assortment planners with much greater presentation skills with brighter and more inviting stores. I am a bigger Home Depot fan. They have better lumber, and you can get nice discounts for seconds wood and broken bags of landscape materials. 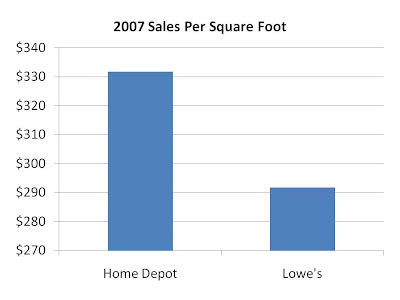 I used to shop at both, but t had customer service issues at Lowes, so switched to mostly Home Depot.